Adventure camping at Polihale State Park. Its been almost a year since our last blog post and time has been flying by. We have been expanding our fleet and are excited to have our newest member hitting the road soon. Our new 2002 Toyota Tacoma has made an excellent addition to the family with its unmatched reliability. Here are a few showcasing its radical transformation from a working mans truck to an outfitted overland rig in few months. Here is what we started with, a 2002 Toyota Tacoma. Pretty much as stock as it gets. We sold off the lumber rack but luckily scored the roof tent from the previous owner. This saved us lots of time sourcing a new tent from the mainland. We decided to keep the Tepui tent on this build and will see how it holds up over the next few months. First thing we did was swapped out the tires and rims and gave it a nice 3in leveling kit. Now its starting to look like a rig we would be driving around. I didn't care too much for the shiny wheels so I plastidiped them black. I think it makes the vehicle look a lot tougher and asthetically pleasing. Next order of business was mounting the camper shell which was surprisingly hard to find on this small island. I spent a few days building a custom drawer set up in the rear of the vehicle which came out pretty good. I decided to use a Paste Wax for the bottoms of the drawers rather then sliders because we get so much salt and sand on these vehicles. Used a nice Ebony stain and they were ready to be stocked with the camping essentials. One of my favorite parts of this build is the custom Diamond plate window we had installed to the camper shell. The weakest part of all campers are its windows, so incorporating this into our build it not only looks cool but adds to the security of the rig for our guests. We used Trim-lok around the edges and existing hardware from a spare snugtop shell to retrofit this onto our vehicle. That's about it for this build but here are a few images of how it sits today. 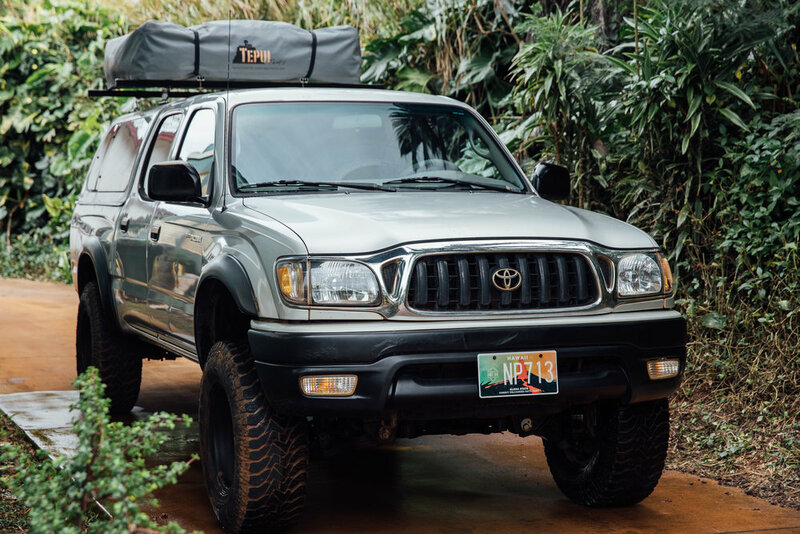 This 1st Gen Toyota Tacoma looks like its going to make an excellent camper rental in our growing fleet of vehicles. 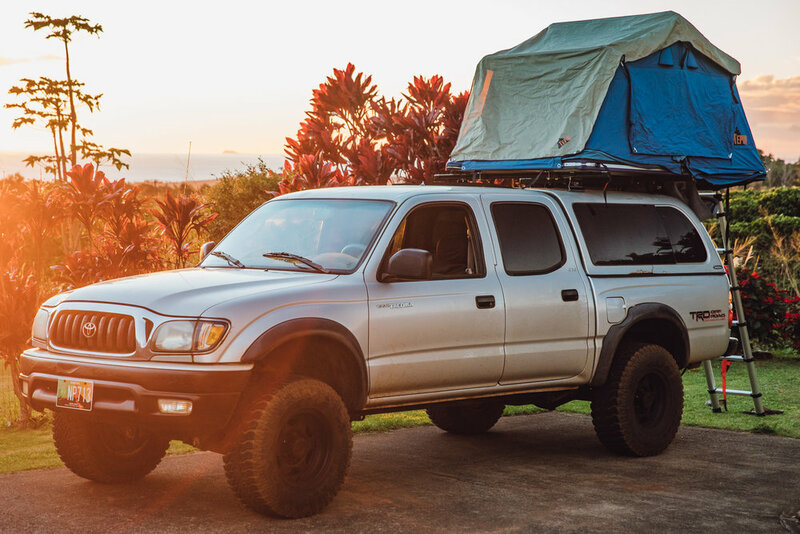 We hope you will come visit us on Kauai and take the Silver Surfer on a 4WD adventure of your own. Aloha!